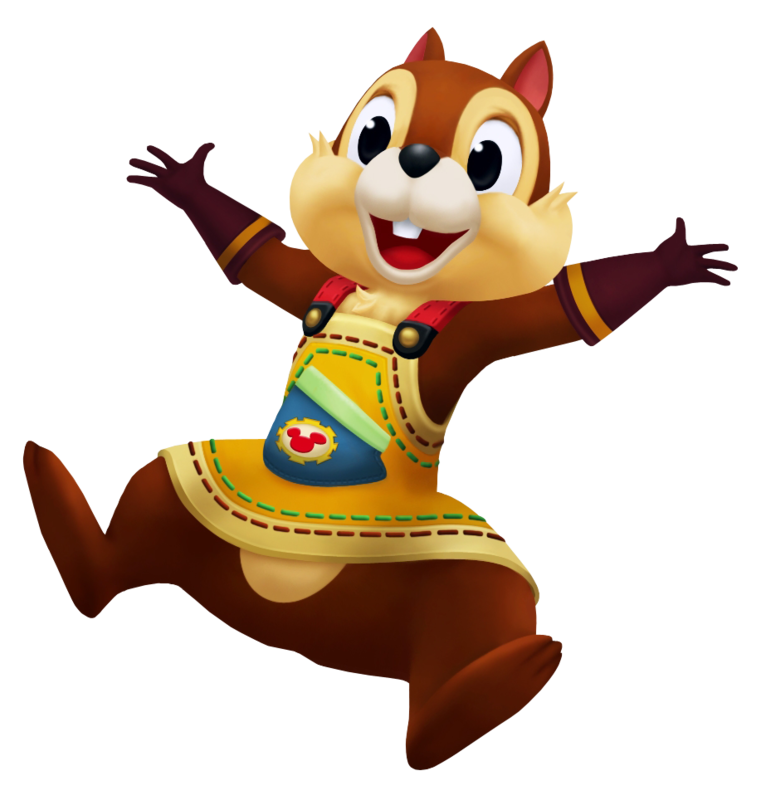 Chip is one of the kingdom's mechanical specialists. He is the one with the black nose and a single front tooth. He is also more serious and diligent than his partner, Dale. The two are in charge of maintaining the gummi ship and are first seen launching Donald and Goofy as they head to Traverse Town. They also announce new events in the game as the story progresses. Chip and Dale make another appearance in the credits with Queen Minnie and Daisy. Chip has been of great help to Sora in his first adventure, and he's ready and willing to live up to his past deeds once more. An expert on everything Gummi Ship related, Chip is one of the two lookalikes who make sure Sora has a Gummi Ship to travel with and constantly perform upgrades on it. He looks almost identical to Dale, yet is notable for his black nose, while the other sports a bright, round red one. A brotherly duo of the older, mature Chip and the playful Dale manage the Rumble Race track in Disney Town. When Terra arrives and barely avoids injury, they and Queen Minnie explain to Terra Pete's bad conduct on the raceway, and request his help. When Terra emerges the winner, they promise to vote for him to receive the Million Dreams Award. A bright-eyed chipmunk who, along with his cousin Dale, serves as head technician at Disney Castle. Quick intelligent, he fully applies himself to every task assigned to him. In adventures past, he and his cousin assisted Sora, Donald, and Goofy in multiple Gummi Ship operations as they traveled between worlds. Now, they monitor the party's progress as they venture inside the data worlds of the journal, serving as a real-world link to the castle.